The sophistication of this product is not apparent at a glance. A movement of the clamping cylinder and the clamping unit moves forward, the work piece is clamped radially and pulled to the center through the pull-back effect, offering an extremely high level of clamping force. Thereby the possibility of running high cutting values »between the centers« is given. In this process the structural dimensions are much lower than usual; however, with the customary SPANNTOP bite. 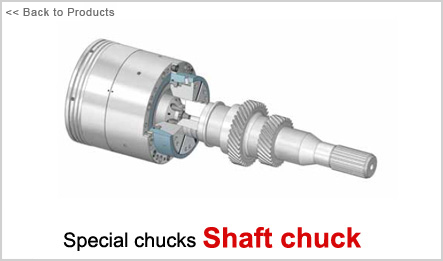 A simple, normal and economical clamping cylinder suffi ces to actuate the chuck.